The Epistle to the Galatians is a letter from Paul of Tarsus to a number of early Christian communities in the Roman province of Galatia in central Anatolia. It is principally concerned with the controversy surrounding Gentile Christians and the Mosaic Law within Early Christianity. Along with the Epistle to the Romans, it is the most theologically significant of the Pauline epistles, and has been particularly influential in Protestant thought. Paul's letter is addressed "to the churches in Galatia." 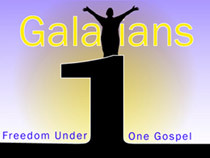 The main theme was that the people of Galatia have turned away from God's word. The churches of Galatia (Antioch of Pisidia, Iconium, Lystra and Derbe) were founded by Paul himself (Acts 16:6; Gal 1:8; 4:13, 4:19). They seem to have been composed mainly of converts from paganism (4:8). After Paul's departure, the churches were led astray from Paul's Christ centered teachings by individuals proposing "another gospel" (which centered around Judaism and salvation through the Mosaic Law), whom Paul saw as preaching a "different gospel" than that of Jesus Christ (which was centered around salvation by God's grace and Christ's atonement, not the "works" of the Mosiac law). (1:6–9). The Galatians appear to have been receptive to the teaching of these newcomers, and the epistle is Paul's angry response to what he sees as their willingness to turn from his teaching. The identity of these "opponents" is disputed. We do not have a record of their activity, but are left to reconstruct it from Paul's response. However, the majority of modern scholars view them as Jewish Christians (i.e. Judaizers), who taught that in order for pagans to belong to the people of God, they must be subject to some or all of the Jewish Law. The letter indicates controversy concerning circumcision, Sabbath observance, and the Mosaic Law. It would appear, from Paul's response, that they cited the example of Abraham, who was circumcised as a mark of receiving the covenant blessings (Genesis 17). They certainly appear to have questioned Paul's authority as an apostle, perhaps appealing to the greater authority of the Jerusalem church governed by James the Just. It appears the teachers made some headway among Paul's converts. Sociological research has suggested that converts from dominant paganism may have suffered a "loss of identity", and found the clarity offered by a Jewish identity and a law-observant lifestyle attractive. Paul responds angrily. He rehearses his conversion and apostolic credentials, records his relationship with the Jerusalem Church, and engages in an argument over the interpretation of the Abraham story.